Some of us believe that Love makes everything beautiful. Love bends all laws of reality and perception just to please every senses that we have. Well that is the Sunday school version. Love is in fact the most ugliest and probably the most dangerous thing we will ever encounter in our life. And I won't sugar coat it, because that is what this play I saw weeks ago showed me. Written by the english playwright Patrick Marber, Closer is a cautionary tale about four people who crosses paths because of guess what... Love. But this is not your typical four way Love yet it happens everyday without most of us noticing it probably because we are all so busy and disillusioned by the fairytale concept of this four-lettered feeling. Marber's depiction of Love puts every character in this play on a wild rolleroaster ride of emotional explotions that left everyone of them scarred for life. The story and material is a brilliant work of art but still an ugly picture of human condition. I thought I already saw all kinds of Love stories but Closer is definitely one of those that hit me so hard. Though the material wounded me and left me contemplating about Life, the actors who played every character gave me a counter pleasure for my heartache. These four talented artists gave me a night of orgasmic performance that it makes me feel like I'm enjoying a meal prepared by the gods. Mark Abaya's confused and conflicted Dan makes a good contrast to Bart Guingona's refined but commanding Dr. Larry and I can also say the same with Cris Villonco's mischievous Alice to Angel Aquino's quiet but determined Anna. I can't hardly ask for more because these people gave me everything, probably even more. And also I strongly advise the theater newcomers (Angel and Mark) that they should do more plays because this is definitely a calling sent from above. Of course the whole meal is nothing without the chef. I mentioned that the show is like a meal prepared by the eternals? Well that is an understatement because Ana Abad Santos is absolutely one of the best Director out there. One of my favorite Actor and Director in the industry. I first fell in Love with her work as a Director with Repertory's The 39 Steps. On that project, I saw her conviction and she knows her material. So I never doubted her when I found out she is directing this play. This is trully another addition to her long list of successful triumphs. Summing everything up, if we speak about material, Closer could leave you with a heavy heart. it deals with reality and like what many people say, reality bites and it bites hard enough to make you bleed. Closer will show you the other face of that fairy tale Love story we all know and it is ugly and extremely depressing. 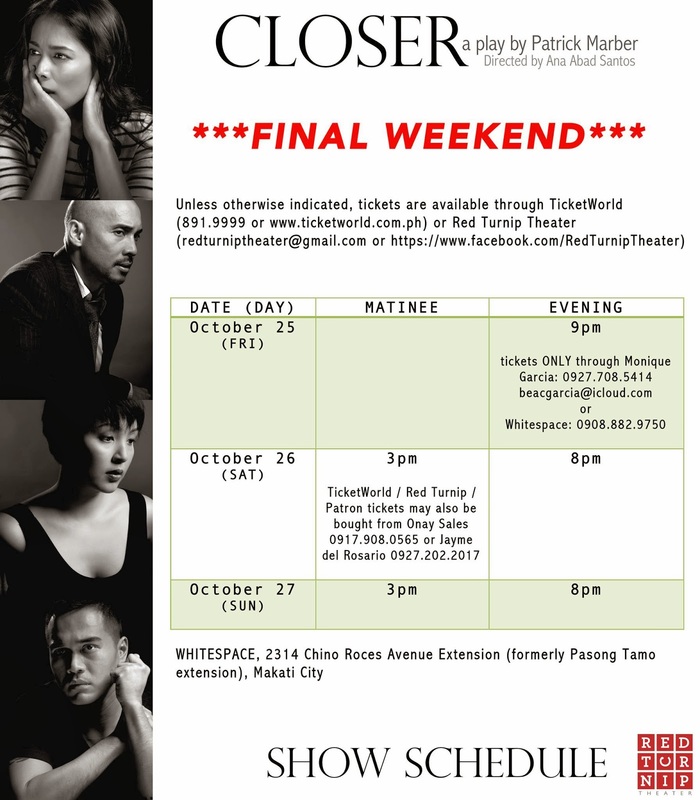 But with a good set of people working on it from actors, director and staff, Closer is one hell of a show that you should never miss. Closer is having their final shows this weekend starting later (Oct.25) 9pm, tomorrow (Oct. 26) 3pm and 9pm and on Sunday (Oct. 27) 3pm and 9pm. For tickets refer to the indicated contact details above or get in touch through facebook by visiting Red Turnip Theater on Facebook.